Barbecue and grilling are widely popular in Russia. Most of the time the Russians enjoy Caucasian style shashlik. The main difference to European or western style barbecue is the size of meat pieces. In the Caucasus, small pieces of meat and vegetables are thread onto long metal skewers. This reduces the cooking time and allows preparing the main and the side dish at the same time. It is important not to pack the skewers too tightly. Otherwise the meat will not be cooked through. Especially kids love to bite juicy meat pieces right off skewers. Cut meat into cubes (5-6 cm (=2 inches)). Finely chop an onion and chives. Put everything in a saucepan, pour in vinegar and season to taste with salt and pepper. Knead marinade into the meat. Cover and refrigerate for at least 4 hours. Slice remaining onions. Cut vegetables into cubes. Thread meat onto skewers, alternating with vegetables and onion slices. Grill on a charcoal grill for about 10-15 minutes. 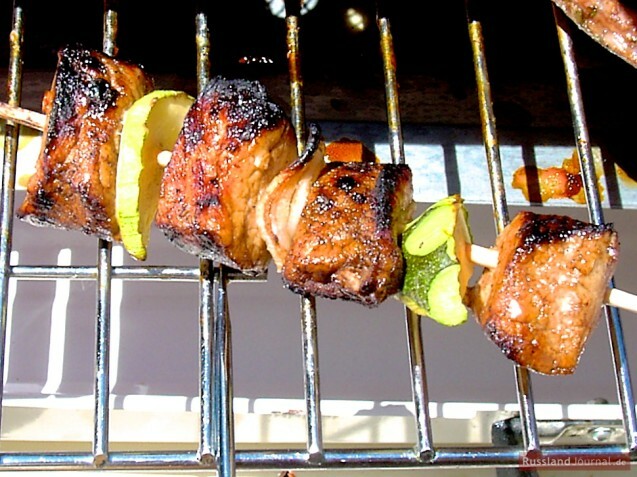 It is also possible to use other barbeque grills or a pan.